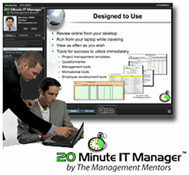 Tom Mochal and I just announced three new bundle options for the 20 Minute IT Manager. HUGE SAVINGS on any of the bundled options. Every topic is 20 minutes in length or less and great ” lunch and learn” sessions. They will be resources you will reference for years to come. CLICK HERE to learn more and view the entire topic list. This entry was posted in IT Manager Tools and tagged 20 minute it manager, 20mitm, it manager training, leadership training, mike sisco, project manager training, tom mochal. Bookmark the permalink.